The tiny but tremendous East Evergreen Historic District spans just two blocks of Willetta and Lynwood, snugged in by the I-10 on the south, busy 7th Street on the east, and a commercial strip of McDowell to the north. That may not sound appealing at first, but don’t stop reading yet. 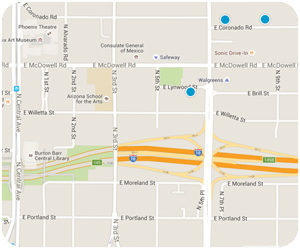 East Evergreen is an interesting and multi-faceted central Phoenix neighborhood. The grassy open space of Townsend Park offers a peaceful buffer of green between McDowell Road and the neighborhood, yet shopping opportunities lie just on the other side. Groceries at Safeway, or coffee at Starbucks, or cash from the credit union or from the new branch of Chase Bank in the former Circle K are all a short walk away for East Evergreen neighbors. To the west, the Burton Barr Library (one of Maureen’s favorite city spots because it’s always bustling with kids and elders, music events and movies, and even its own art gallery on the first floor) is a short walk across Third Street along palm-lined Willetta. The 30-acre Margaret T. Hance Deck Park is right there too when Fido wants more legroom than Townsend Park provides, and so is the latest and greatest coffee spot in Phoenix—Giant (1437 N 1st Street). From the library or Giant, it’s just a few steps more to reach the light rail or the Phoenix Art Museum. Craftsman-style Bungalows with deep front lawns and broad welcoming porches line Willetta and Lynwood between 7th Street and 3rd, many on a generous 1/3rd acre. Inside, you can expect to find somewhere between 900 and 3500 square feet of beautiful workmanship: polished wood trim, built-ins, hardwood floors, and sometimes second stories. These homes are handsome, but they also play hard to get. There are less than two dozen Craftsman Bungalows in the East Evergreen Historic District. The other home choice, found in equal number or more, is the modern townhome averaging around 1200 square feet. The Willetta Grand offers a hybrid of old and new: apartment-flat style townhomes with wood floors and French doors. The thoroughly new block-and-glass Willetta 9 or Evergreen 9 have open layouts spanning three stories of polished concrete floors and exposed beams. A close-up view of downtown Phoenix is framed by every south-facing window with South Mountain as a backdrop. 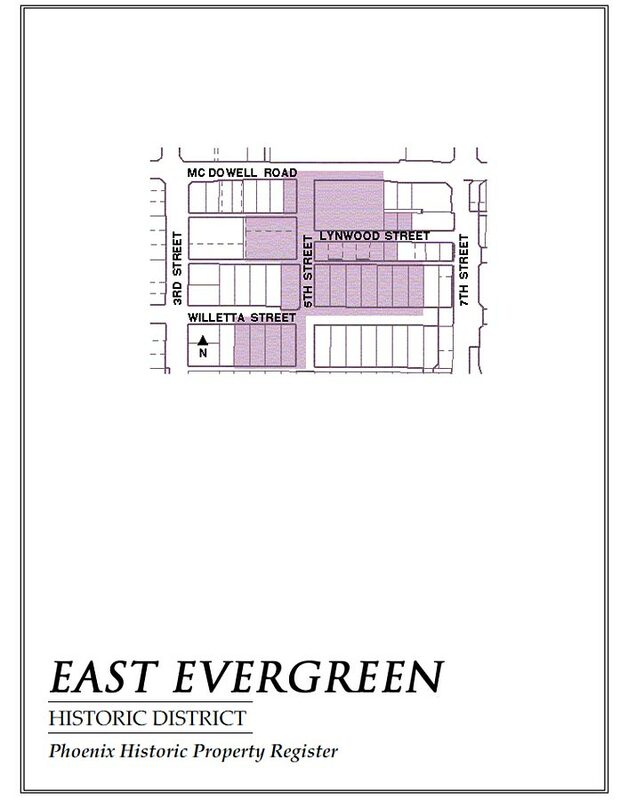 East Evergreen Historic District is not the cohesive suburban setting that you would expect in the residential Del Norte or Willo historic districts. But if you are looking for a close-in neighborhood with an interesting mix of history and architecture, past and recent, the East Evergreen Historic District is definitely worth a look. And if a home here is playing hard to get, you might also like the southern end of the Roosevelt Historic District, just a half mile to the west. Margaret T. Hance Deck Park is home to the Japanese Tea House and Friendship Garden (http://www.japanesefriendshipgarden.org/index.html), the Irish Cultural Center (http://www.azirish.org/) and many events.